I love recipes from America’s Test Kitchen. You know what I love the most? That they do all the work for you. They pick a recipe, research the heck out of it, find what works best (and what doesn’t) and then explain it all in easy to understand instructions. When you make an ATK recipe, you know it’s going to work out every single time. This weekend, I tried the Chewy, Fudgy Triple-Chocolate Brownies from their Complete America’s Test Kitchen TV Cookbook. What a book! It contains all of the recipes featured on their show from 2001 to 2011. It’s a 10-year anniversary gift to ATK lovers everywhere. Don’t have it yet? Well, you should. It’s a keeper. Of course, you know me. I can’t make anything exactly as written. It’s my unspoken rule, except that I speak openly about it. My tweak – I added a bag of Andes Chocolate-Mint baking pieces. The colorful green striped variety. And I make no apologies for it. Sometimes a girl needs mint in her chocolate. Adjust your oven rack to the lower-middle position and heat to 350F. Line an 8″ square baking pan with foil (sling-style so they’re easy to lift out) and spray lightly with PAM or other non-stick spray. In a heatproof bowl, place chopped chocolate and butter into a double boiler or in the microwave in 1 minute intervals until melted and smooth. Whisk to remove any lumps. Whisk in the cocoa powder and beat to combine. Set aside to cool slightly. In a large bowl, beat the eggs, sugar, vanilla and salt until combined, about 15 seconds. Whisk the warm chocolate mixture into the egg mixture. Using a spatula or wooden spoon, gently stir in the flour (and mint baking pieces) until just combined. Pour into the prepared pan and shake gently to distribute, or use a spatula to spread the batter evenly out to the corners. Bake until slightly puffed and a toothpick or skewer inserted into the center comes out with a few moist crumbs attached. Baking time will be approximately 35-40 minutes, depending on your oven. Remove from the oven and allow to cool on a wire rack to room temperature (about 2 hours). Lift the brownies from the pan using the foil sling. Cut into 1″ squares and serve. NOTE: these are really dense and very rich; 1″ squares is a really good size for these! The Complete Package is the master of ice cream in our house. Christine, our evil but effective Cuisinart ice cream maker, is his baby. He plays her like an instrument. Using his favorite knock-off recipe for Ben & Jerry’s sweet cream ice cream base, he added mint extract and a few drops of green food color to make this pastel peppermint concoction. And it was good. Really, really good. So, there you have it. Yet another America’s Test Kitchen recipe that came out exactly as advertised. Tweaked into a minty pair of lovely treats by yours truly, because I just can’t seem to stop myself. And I’m okay with that. I stare at the screen plotting my revenge against the wall and distance that separates me from these frosted, minty confections. Damn you computer screen!!! Hahaha! Thanks, Megan. They are a great stand-alone brownie, but they’re even better with a scoop of the ice cream on top. It’s peppermint bliss. I’m glad I live what, 600 miles away….I can feel the pounds coming on just looking at them! That’s why you eat a few and give the rest away! Ohh…after a stressful day at work….this could be dangerous! Looks amazing! I can only imagine that it would also be great in the summer when it’s hot outside, too. Guess we’ll have to pull this one back out in May-August and find out! PS – I loved your Prague photos, Anita. We were just there in October and loved it. I don’t know why TCP’s creation took me by surprise but once I processed what had happened, I thought, “Of Course He Would.” What a perfect reincarnation. At first this post made me sad because I was like “I don’t like brownies anymore. And I can’t try these.” Then I saw that the recipe calls for mint. And I don’t like mint with my chocolate. That made me feel a little better. Even though I can’t eat them, they look pretty…especially in the ice cream. At first I was sad because I was all like “Ahhh, Thoughtsy doesn’t like brownies anymore!” Then I saw that you don’t like mint either, and I thought “Wow. I’m two for two with Thoughtsy.” Then I thought, “Well, you can’t win them all” and that made me feel a little better. Sorry, Thoughtsy. TCP is already thinking about taking on a raspberry ice cream, so stay tuned. Unless you don’t like raspberries. Then you’re going to have to give me something to work with here. And don’t say you don’t eat frozen custardy treats, because I know you and Keifer Sutherland visit that fro-yo place (regularly). Have a great weekend, Thoughtsy! I make actually make these brownies for Kiefer. He loves mint. When we first started dating, he only had mint chocolate chip ice cream in his freezer, so I had to force it down a couple times before I finally admitted I disliked it. Oh bless, America’s Test Kitchen has a website too. After spending the past two evenings (and a considerable part of the night) watching episodes, I only barely managed to hang on to my New Year’s resolutions. Plus Jeroen is now convinced his life is incomplete without a smoker. Yay! Sorry about that! You’ll love America’s Test Kitchen, and Jeroen is probably right about that smoker. It’s scientifically linked to testosterone, you know. Chocolate and mint is one of my all-time favorite combos! Mint chocolate chip ice cream + Oreo crumbles is a winner too. I wish I could jump through the screen and try that ice cream. I love mint chocolate chip, too. And Oreos, as long as that horrid creme center is removed. It’s icky. I can hardly contain myself…that all looks SO GOOOOOOOOOD. I want an icecream maker this summer; my husband is very wary, but once I explain that my homemade stuff will be much cheaper (because I don’t have to buy the expensive organic stuff anymore), I think he will totally be on board. I am really excited to “know somebody” who has tried the Cuisinart and loved it. Can’t wait to get me one!!! Oh, you gotta get one! It’s awesome. And evil. And fast. And dangerous. And fabulous. It also makes smaller batches than the 1/2 gallons of Blue Bell we used to bring home, so it’s a total win/win. Let me know when you get yours. Can’t wait to hear what you whip up first! 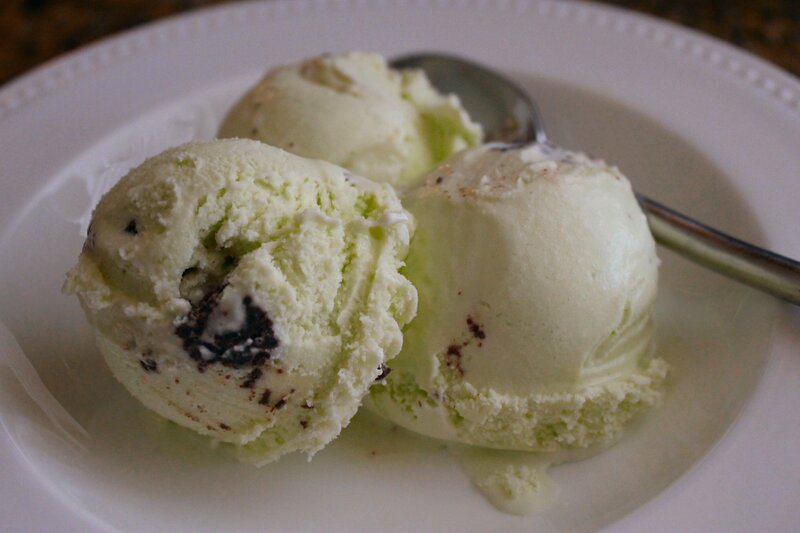 Oooo…you lost me for a minute on the mint chocolate brownies, but I came right back with the minty brownie ice cream. Not a huge mint chocolate fan, but I *love* that combo in ice cream. Weird, I know. True story: I just bought not one, but two pints of cream to play around with the B & J sweet cream base again. I’ve got a package of Oreos and SunButter, and I’m not afraid to use them! This ATK brownie recipe is very dense and extremely chocolatey, which is a very good thing in my book. The chocolate mint brownies were good, but I’ll be honest – it’s not my favorite combination either. In fact, this may be the first time I’ve ever made chocolate mint brownies. I had the mint chips from Christmas, and decided to use them. 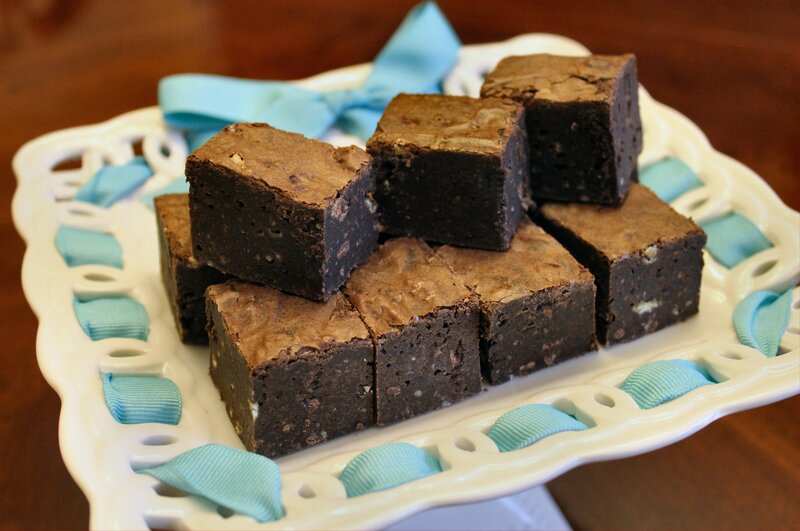 My favorite brownie of all time is an old recipe I used to make for cream cheese brownies. They were made with honey and they totally rocked. I may have to dig that one out and bring them back again. And the mint chocolate brownie chunk ice cream was a winner, but it wasn’t nearly as good as the fresh raspberry TCP made this weekend while I was in Austin. I had a bowl last night, and WOW was it outstanding! Oh my goodness glory girl…just kill me now!!! This Ozark Farm Chick popped over from Ree’s place ’cause I so loved your name. NanaBread…if that don’t say lovin’!! !